Treasure is what you’ll find in the upstairs galleries of The South Street Seaport Museum in Lower Manhattan, following its daring rescue by The Museum of the City of New York. Armed with a two-year plan, a dedicated team, and construction crews, MCNY figured out how to transform former storage areas into sixteen beautiful galleries, re-open, and give new life to the museum and iconic tall ships anchored downtown. The second is the adjacent gallery, where you can sit down and contemplate three stunning simultaneous views of our waterfront — Paul Strand’s famous 1921 documentary of our waterfront (Manhatta), Edison’s early 1900s views of our water’s edge, and a contemporary visual meditation. Time travel doesn’t get any better than this! 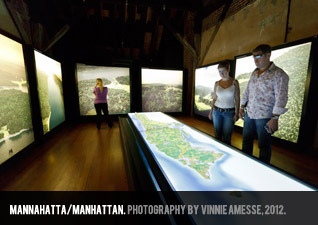 The third view, MCNY’s Timescapes film, sweeps more grandly over time and history. Images pop onto three screens as Stanley Tucci narrates the whole, complete story, from forested island to home of the High Line. It’s hard to take it all in, but you’ll be swept away and seriously, it will make you proud. Although these shows are in open-ended runs, check them out sooner rather than later. Although the Seaport Museum has been thrown a lifeline, it’s only temporary. MCNY only has 18 months to demonstrate that these stories, ships, artifacts, buildings, Bowne & Co. Stationers, and galleries are worth saving. Be part of the rescue. Shop at Bowne, bring your friends, and step back in time. This entry was posted in Art, History, Museums, Nature and tagged art, culture, museums, nature, science by mssusanb. Bookmark the permalink.